But the harrowing realism of “The Father,” now receiving its Chicago premiere in a production by Remy Bumppo Theatre, works a twist on this theme that is altogether more brilliant. For instead of simply seeing to it that we observe and empathize with that form of breakdown, the award-winning contemporary French playwright Florian Zeller (in a translation by British playwright Christopher Hampton), finesses a remarkable feat of imagination that uncannily makes the audience experience the same disorientation, confusion, frustration, anger and fear that accompany the protagonist's own loss of clarity, control and certain aspects of memory. And it is almost certain that Zeller was propelled to write this play after watching someone go through such a transformation firsthand. It is profoundly sad and disturbing to watch the unraveling of the play’s central character, Andre, especially if you have observed the phenomenon in a person you know and love. 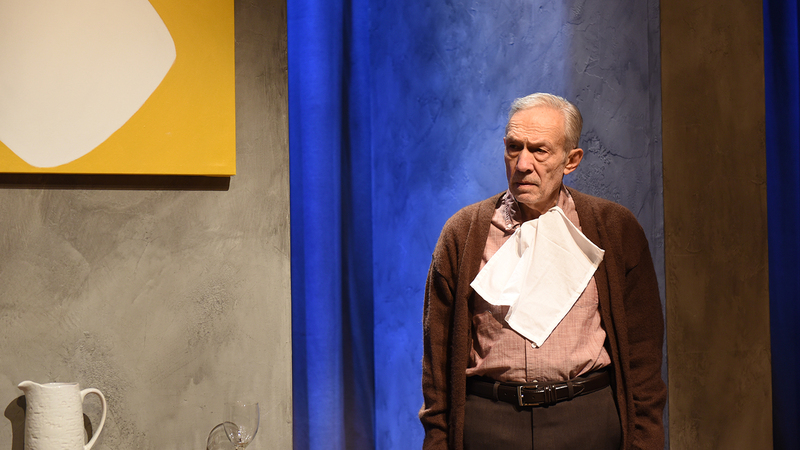 Veteran actor David Darlow gives an altogether shattering performance as man in his 70s who was once a successful engineer and though still quite physically fit is clearly losing much of the essential wiring in his brain. At the same, Andre furiously grabs hold of just enough of those connections to realize that he is undergoing enormous changes. And he tries with every fiber of his being to rebel against this loss of control. In the process, he lashes out against his devoted but exhausted daughter, Anne (deftly played by Linda Gillum), telling her he has always loved her sister (who he refuses to acknowledge died in an accident years earlier) more. He confuses Anne’s decidedly unsympathetic and selfish partner, Pierre (Anish Jethmalani), with her first husband, who may or may not be the stranger played by Bobby Wilhelmson. Andre alternately battles against and engages with several caretakers, including the young, giggly woman (a winning turn by Alys Dickerson) who he happily flirts with and then berates for treating him like a child, and the more experienced nurse (a winningly restrained Laura Resinger), who he reaches out to like a mother. The play unfolds in a series of short, sharp scenes and is set primarily in Anne’s large, chicly modern, minimalist Paris apartment, where Andre, whose condition has made it impossible for him to live on his own, has been living since he drove away a couple of caretakers. Or could Andre actually be living in his own apartment, and is Anne trying to take ownership of it? And where is Andre’s watch, his most essential possession, which he has either hidden for safekeeping or believes someone has stolen? The symptoms are classic. In the meantime, Pierre has just gotten a job in London, and Anne plans to move there with him. Pierre is more than a little blunt in his wish that Andre would just expire, or at the very least, that Anne would put her father in a nursing home and they could be free to get on with their lives. But Anne, despite her exhaustion, cares about this difficult man who can still be charming in his way, and who she confesses scared her in childhood. The Remy Bumppo production, skillfully cast and directed by Kay Martinovich, is enhanced by Yu Shibagaki’s elegant set (lit by Brandon Wardell), with its mottled gray walls, large French window and cleverly selected abstract paintings that in their own way suggest a troubled brain. And there is fine music and sound by Christopher Kriz. But it is Darlow’s taut, wrenching, tour de force performance as Andre that is of the essence here. And when, in a moment of utter poetic clarity, his character says he feels like he is losing all his leaves, you can only weep. Remy Bumppo Theatre’s production of “The Father” runs through March 3 at Theater Wit, 1229 W. Belmont Ave. For tickets ($37.75-$62.75) call (773) 965-8150 or visit www.RemyBumppo.org. Running time is one hour and 40 minutes with no intermission.